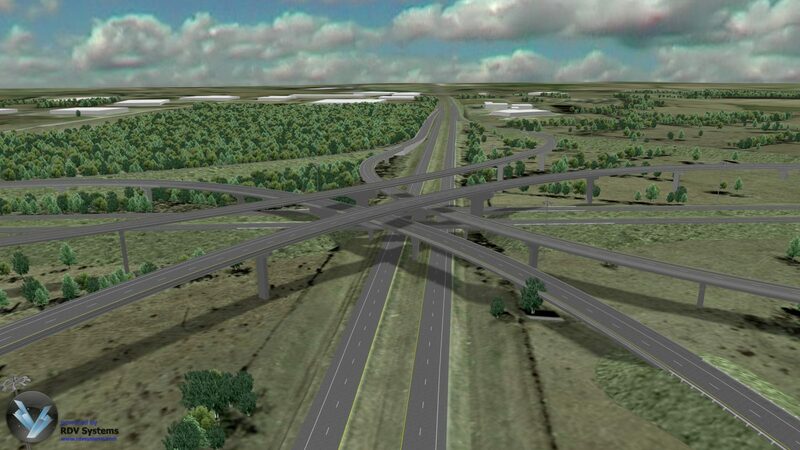 This RDV model shows a three-tier interchange. In it you can see a planned outer loop highway around the City of Montgomery, Alabama as it intersects Interstate Highway 65. With the interactive model, the client is able to assess the visual impact of the proposed interchange, and present the project to stakeholders and the public in a way that is easily understood. Different driving routes can be simulated through the interchange, safety characteristics such as stopping sight distances can be analyzed, and potential issues such as encroachment on adjacent properties can be identified, all in the early stages of the project.